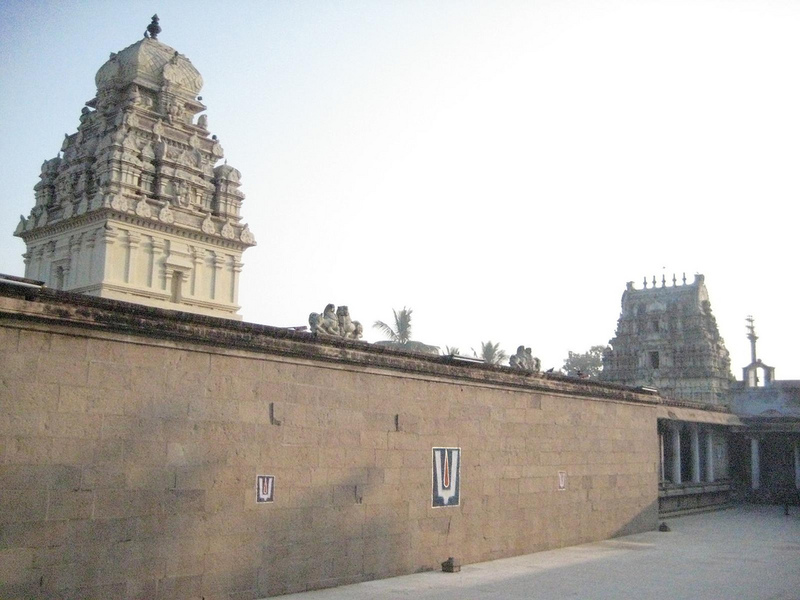 The Vijayaraghava Perumal Temple is among the 108 divyadesams of Sri Vaishnavas and comes under Tondai naatu divyadesams in Kanchipuram. 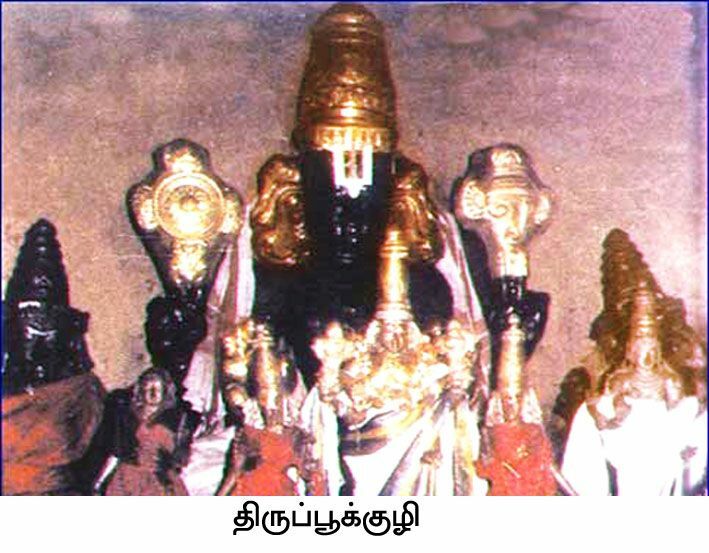 This is the only divyadesam that is a bit far from other 14 divyadesams of Kanchipuram. The presiding deity is Sri Vijayaraghava perumal in a sitting posture and thayar in a seperate sannadhi is called Maragatavalli thayar. In this Shrine, the presiding deity appears keeping Jatayu on his thigh. Whenever the Lord comes in procession, equal importance is given to Jatayu also. As a mark of respect to Jatayu, the flag post and Balipeeta are outside the temple. In Srimad Ramayanam - Maharishi Valmiki describes ‘Abduction of Goddess Sita Devi’ by the demon King Ravana. Lord Rama during his exile from his Kingdom Ayodhya arrived in the woodlands with his borther Lakshman followed by Sita Devi in order to keep the promise given to his father - King Dasaratha. While their stay in a hermitage at Panchavati, Sita Devi was fascinated by a Golden Deer. Though the Mother of the Universe was well aware of the fact that there is no golden deer existed, she impelled Lord Rama to get the possession of the same. Lord Rama continued to chase the deer far away woods, later Sita Devi could listens to the cries for help of Lord Rama. She persuaded Lakshman to save Lord Rama from the dangers. Lakshman was very confident about the skills of his brother, refused to follow the words of Goddess Sita Devi. Sita Devi was totally miserable and in a moment she was suspicious about Lakshman’s affection towards her. Lakshman thoughtfully trying to reveal his intention to safeguard Sita Devi from all the uncertainties and theirby keep up the promise given to his brother. At last, Lakshman had to leave Goddess Sita alone in the hermitage. Before leaving, Lakshman drew a line ‘Lakshman Rekha’ and instructed Goddess Sita Devi not to cross the line at any circumstances. He left Sita Devi alone and walked away heavy heartedly. At once, there appeared a saint asking for alms. Goddess Sita most willingly and respectfully offered alms to the saint. But the saint refused to receive any alms and instructed her to cross the line and give charity. Without any hesitation Goddess Sita Devi followed the instructions of the holy man. Soon, the holy man forcefully took the arms of Sita Devi and exposed his real form. Thus, Ravana abducted Goddess Sita from her hermitage and carried her in his celestial vehicle ‘Pushpaka Vimanam’ to Lanka. On their way, the King of Birds – Jatayu appeared on the sky and fought with the mighty warrior Ravana. Jatayu heartily desired to save Goddess Sita Devi from the clutches of the demon King Ravana. Unfortunately, Jatayu could not withstand the fight for long time. Ravana cut down the powerful wings of Jatayu. Jatayu fell down helplessly on the Earth with a dull sound. Lord Rama continued his search for his dearest wife all through the forest and reached the place where Jatayu rested. Jatayu was holding his last breath to inform Lord Rama about the aduction of Sita Devi by the demon King Ravana. Immediately after informing the wretched state Sita Devi, Jatayu took his last breath. Lord Rama performed the last rites of Jatayu in Thiruputkuzhi and blessed him with Salvation, therefore this sacred temple also known as ‘Jatayu Mokshasthal’. Jatayu – The King of Birds belongs to ‘Pul’ (category) and ‘Kuzhi’ means ‘Pit’, that’s how Thiruputkuzhi has got its name. Mother is greatly praised by the devotees for Her grace and power of germinating even fried pulse. The custom followed in the place is strange. Women use to have a dip in Jayayu Theertham, go to sleep at night with fried pulse tied in the sari. If they find the pulse germinated when they wake up in the morning, it indicates child boon granted. Yadava Prakasa, the Guru of Acharya Ramanuja lived here. There is a stone horse vahan in the temple with moving limbs, a wonder in Tamil Sculpture. The sculptor, after making this horse, vowed not to make one such till his death. As a mark of respect to the sculptor for his skill and determination, Lord visits the street named after the sculptor on the 8th day of the festival. People believe that performing tarpan to ancestors on the new moon day in this place would bring them double benefit, as Lord Rama performed last rites to Jatayu in this place. For water needed for the rites, Lord Rama shot an arrow and created a spring, now called Jatayu Pushkarini. Festivals: Float festival in Thai month-January-February; Masi Brahmmotsavam in February-March; Aavani Pavithra Utsav in August-September, Purattasi Navarathri in September-October and Tirukarthikai in November-December are the festivals celebrated in the temple. Vijaya Raaghava Perumal is seen in a sitting posture, having the bird (Jataayu) on his thigh. Not able to bear the smell caused by the final rites and because of the flames that arose out of the cremation of Jaatayu, Sri Devi Thaayar is said to have moved to the other side of the Lord. At this temple, the Goddess is seen to the left of the Lord Vijayaraghava with her head slightly turned in the Lord’s direction (in all Divya Desams, Sri Devi Thaayar is seen to the right of the Lord). Also, the Thaayar Sannidhi is to the left of the Lord…In all Divya Desams, the Thaayar Sannidhi is always to the right of the Lord. The temple is open from 07:00 a.m. to 12:00 noon and from 04:00 p.m. to 07:00 p.m.
Tiruputkuzhi is 80 km far from Chennai on the Vellore road. From Kancheepuram it is 13 km. The devotee has to get down at Balu Chetty Chatram stop.